Guest Post: We Share the Road? The image caught me off guard, as I couldn’t imagine why a cyclist so close to a moving vehicle would be smiling and waving. I found myself trying to judge the actual distance between car and cyclist, and couldn’t come up with anything more than 70cm. Then the lights changed and the billboard was gone. Over the following days the incongruity between image and message kept coming back to me. Was I imagining things? Was the image so distorted or warped as to misrepresent the situation completely? How did 70cm clearance demonstrate “sharing the road”, exactly? I eventually reached the conclusion that, distorted or not, the image did not fit my idea of safe road behaviour. The council’s response suggested that the campaign was not intended to reinforce the idea of giving cyclists room when passing (1.5 metres ideally, as suggested by the NZ Road Code), but to promote courteous behaviour by all road users. It was also suggested that 1.5m was often not realistic for Christchurch road conditions. I agree with promoting courteous behaviour by road users. However, I cannot see how this billboard will achieve that goal. The only road user in the image is the cyclist, who, while he certainly seems to be acting courteously, doesn’t have too many options, between the kerb and the car. Are we to take the message that cyclists should be careful and courteous road users? This is an important aspect of road safety, but it is only part of the picture. There is no driver visible in the car – for all we know, the car is parked there, driverless. Faces are important in advertising to carry emotion and demand empathy from the audience. This advertisement seems at odds with other recent road safety campaigns, such as NZTA’s “drive social”, or “see the person, share the road”, where people and faces are emphasised. It would be hard for drivers to identify with the courteous road use message, given that there is no driver in the image. Most importantly though: no matter what angle I hold this picture on or which eye I close, there is nowhere near enough clearance between this car and this cyclist. While I understand that this is not the intended focus of the campaign, anything claiming to promote road safety should at least be consistent with the guidelines in the NZ Road Code. Billboards bearing this image are prominently placed and highly visible. What message should a driver take away from this? That <70cm clearance for a cyclist counts as “sharing the road”? I have put this post together for two reasons: a reality check for myself, and to fulfil an offer I made to CCC to gather some wider views on this campaign. Both rely on your feedback, so please make a comment below!! The only positive thing I can take out of it is at least it’s trying to say that not all cyclists are red-light jumping hooligans. Dan, the message tells me that CCC doesn’t understand the needs of cyclists, and that cyclists should be happy with the small amount of space they get. I’ve spent over 4 years, tens of thousands of dollars, and thousands of hours alerting CCC about the dangers of roads in a new Yaldhurst subdivision that they were erroneously permitting to be built well below required road safety standards. CCC not only endorsed the developers proposal to eliminate the cycle lanes, the right turn medians and the safety recessed parking designs on the main collector roads, but they spent hundreds of thousands of ratepayers dollars fighting against the affected public to oppress them and to retrospectively consent the narrow non-complying roads. … “vehicles would yield to cyclists rather than squeeze them”. This picture is the exact result CCC fought for, except replace the kerb with parked cars and the car with a bus, as per the busy Yaldhurst roads transport requirements. Good luck with getting CCC to listen. Agree, you would think the concept of sharing the road is about giving each other enough space.This is certainly not courteous driving behavior and not many cyclists would be this ecstatic if they are overtaken with only this much space.The campaign might be well intended but sends the wrong message and seems a bit naive. CCC’s core role is to ensure that there is adequate space on new roads to accommodate the modal requirements and traffic volumes of them. There are accepted NZ safety standards for this, and CCC has its own Infrastructure Design Standards (IDS). However, Christchurch Councillors recently voted to disregard these safety standards and let staff negotiate narrow road widths with developers. The driver is faceless. Therefore not part of the sharing ? Also blameless if sharing doesn’t occur ? I feel it’s important that all road users give each other space and time. There’s too much rushing from queue to queue at moment. If that were reality, the cyclist would be grimacing in horror and the raised hand would be about to slap the car to get driver attention. The video at http://www.ccc.govt.nz/cityleisure/gettingaround/roadsafety/cyclesafety.aspx talks about narrow roads and the need for drivers to watch for cyclists coming up on the left. The picture makes more sense in that context. Without that context, it seems like a terrible model. I saw this poster and was perplexed also…thank you for taking the time to put your concerns into words. the council’s response is reflective of a lot of thinking out there…If the road is narrow then the cyclist will just have to be in danger…after all the car needs to get past and well, too bad for the cyclist. My reaction to this is that the motorist needed to wait for a safe place to park, or the cyclist to work out a safe place and let the car pass safely. out of interest are we following up with the council? The posters should be removed! CCC does not get it. No doubt there are great people working there, many of whom cycle. Obviously they are not the ones who make the big decisions. Just look at the draft annual plan. 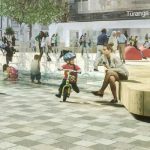 Half a percent of the transport spend will be for cycling. CCC reports that 15% of us cycle regularly, but half a percent is all we get. There is a disconnect. They mouth support, but money is not forthcoming. They want safer roads, but don’t consult with the community on how to do things. It is an ivory tower and from way up there the distance between a person on a bike and a car is simply unclear. I thought the poster gave a perfectly postive message to drivers – cyclists are happy if you squeeze them into small spaces. I can’t think of any other good message the poster conveys; certainly none for the cyclist. It would be great to have these billboard posters removed ASAP. I am glad someone else noticed this billboard, I was perplexed by it too. There was a very good campaign in South Africa that said “Cyclists survive at one point five”. I agree it certainly looks like they think its ok to be that close, its not, its not only scary but dangerous! I have had some close calls with cars being to close when I have been on the bike, puts me of being on the road. The Cyclist Should be a meter out from the kerb. Looks to me like it is the cyclists fault for ending up in an unsafe place on the road. If there is not enough space then move into the centre of the car lane while waiting for space to open up. If there isn’t the room to go along the left hand side of the cars then don’t go along the left hand side of them. It is important to be assertive on the road to be safe. This means not allowing yourself to be pushed off the road. Force Car drivers to give your room. This means if they don’t give you room moving in behind the car ahead and in front of the car behind. The other reason you shouldn’t be hugging the curb is that it reduces the chances of drivers seeing you. 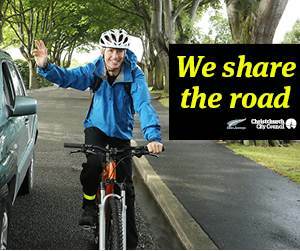 The picture gives the complete wrong message and is encouraging drivers to expect Cyclists to instead of sharing the road, to share the very edge of the road (you can use it provided we are not parking on it). I have listened to peoples complaints about cyclists over the years, To be honest I have little sympathy, it seems to me that people are jealous of the advantages that a cyclist has and just don’t like adapting to change and/or sharing. On the other hand 1.5 meters between cars and cyclists is slightly insane. There is a centre lane and there is simply no need. So it is good that it is put as ‘ideally’. It would be better put as where appropriate. I hate it when cars drive 2 meters around me – feels very scary with them swerving right over to the other side of the road. Somewhere there needs to be a happy safe medium.